Solid, gas, liquid, and...second liquid? Most matter on Earth comes in one of three states or phases — the all-too-familiar solid, liquid, and gas trio. Depending on the environment and how the molecules of a particular element are configured, it can transform from one state to another, and some elements can even have more than one solid form (think carbon existing as both diamonds and graphite). 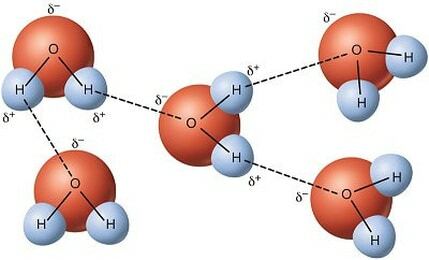 We used to think water followed this standard, existing as either a liquid, a solid (ice), or a gas (vapor), but H₂O might not be as simple as we previously thought. In a paper published in the International Journal of Nanotechnology last month, researchers discovered that some of the physical properties of water change within a particular temperature range, essentially resulting in two distinct states of liquid water. Now, Rodrigo Ledesma-Aguilar, senior lecturer in Physics and Electrical Engineering at Northumbria University, Newcastle, has shared his potential explanation for this odd behavior. In an article published by The Conversation, Ledesma-Aquilar points out that this unusual behavior might be explained by water’s molecular structure. H₂O is interesting because it’s shaped like an arrow, with an oxygen tip with two hydrogens on each side. “The electrons in the molecule tend to be distributed in a rather asymmetric way, making the oxygen side negatively charged relative to the hydrogen side,” explains Ledesma-Aguilar. Because of this, water’s properties tend to differ from those of other liquids, and this second state could possibly be another example of such divergent behavior. Whatever the reason for this second state of water, its discovery puts us on the path to a better understanding of our planet and ourselves — after all, more than two-thirds of the Earth is covered in water, and it is an essential component of life. The more we can understand about it, the better.